Okay…claims are made all the time about something being “the best ever _____” and they hardly ever live up to the reputation they have just put out there in public. Trust me…I’ve been disappointed many times. Life also is a smorgasbord of different tastes, textures, and ingredients. So, when I’m in the kitchen, sometimes I like to change things up…get a little creative. And that’s what happened. You see, I was sitting at work on Monday trying to figure out the best way to use up some bin ingredients that I have yet to touch. Sometimes my week gets too busy and cooking with the items from my CSA bin isn’t always possible. I tend to make it up the following week as another week of CSA bin goodies are cramming my fridge. I love it…but it can be overwhelming. That being said, I messaged my roomie and told her I had red potatoes that needed to be used…and she sent me a recipe from Gluten Hates Me (.com) for what was being described as the BEST gluten-free potato soup…EVER! EVER! That’s a huge, huge claim to be making. But, there were only 5 ingredients, so…I figured why not? I had most of them on hand anyway. The best part is…this soup cooks in the slow cooker. I started mine after dinner the night before and it was ready for me to tackle it with the immersion blender when I woke up. EASY!! This recipe is easy. Is it the best gluten-free potato soup ever? Probably not…but I will tell you this…it is rich, creamy, and packed with flavor. I even added a few touches of my own, which I’ll include in this recipe. Put the diced potatoes, onion, garlic, and vegetable broth into the crock pot. Season with your chosen seasonings. I used cumin, cinnamon, and salt. Stir to combine. Cover and cook on low for 10 hours or on high for 6 hours. Once it has cooked, cube your cream cheese into 2-inch cubes and stir it into the crock pot. Then, using an immersion blender, carefully blend the soup in the crock pot. If you do not have an immersion blender, don’t add the cream cheese into the crockpot. Simply put it in the blender with 1/3 of your soup and blend. Then reincorporate it back into the crockpot. This will give you a chunkier soup…so I do recommend the immersion blender. Top off however you like. I topped mine with green onion and vegan cheese. Simple flavors, but what a combination they had. The soup is this rich, thick, creamy consistency, aided by the cream cheese. It is really fantastic and just wows the taste buds. It is definitely soup season and this was a hearty, delicious, and rather healthy soup to add to the winter lineup. I was very impressed with every bite. And I have more in my fridge and freezer…just waiting for another cool evening. 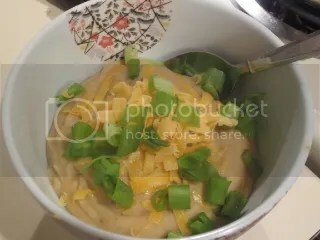 This entry was posted in Cheese, Clean Eating, Entree, Food, Gluten-Free, Potatoes, Recipe, Soup, Vegan, Vegetables, Vegetarian by The Celiathlete. Bookmark the permalink.